Current UC president and former secretary of homeland security, Janet Napolitano, headlined a fundraiser on Sept. 20 in support of Democratic nominee Hillary Clinton — making her the first UC president to actively campaign for a presidential candidate. 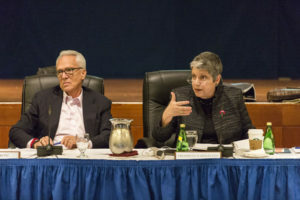 UC President Janet Napolitano (right) speaks during the January regents meeting at UCSF. UCSC employees must abide by a similar policy, as they may support candidates as private individuals but may not use university resources, like paid-time or facilities, to do so. 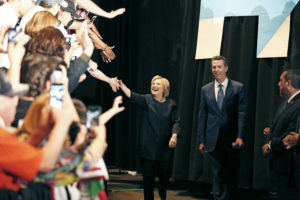 The Silicon Valley event was hosted by Entrepreneurs for Hillary. The online invitation labeled the event as a conversation with the “former secretary of homeland security and former governor of Arizona,” without any mention of her current role as UC president. Admission cost anywhere between $500 to $10,000 a person. Napolitano has a political history with Hillary and the Clinton family that long precedes her career with the university. In 1993, she was appointed attorney for the district of Arizona by then-President Bill Clinton. The Clinton’s support was also said to be vital in Napolitano’s campaign to be governor of the state. As secretary of homeland security for four years under the Obama administration, Napolitano also served alongside former Secretary of State Hillary Clinton.